Deb get’s a little nervous every time a go into the garage for some pruning tools this time of year. Not because she’s afraid I might hurt myself but for what I might do to the plants. Today it was so-called “renovative pruning” of the St. Johnswort ‘Sunny Boulevard’ shrubs that line the western edge of the brick terrace. I approached the shrub with some unconventional pruning tools. Let’s first backtrack and put everyone at ease. A shrub is a shrub because it’s shrubby; that is, it’s always growing new shoots at or near ground level rather than developing a permanent, upright trunk off which permanent limbs and new shoots grow. Some shrubs — most shrubs, in fact — get congested with too many new and older shoots rising from their base and too many old shoots that no longer perform well, in this case performance meaning a good show of flowers. An old stem can put on a good show for only so many years before becoming decrepit. The obvious solution to the above two problems with shrubs is to, first, limit the number of new shoots arising low in or around the plant. It’s a matter of judgement for how many to leave. (Pruning is art and science, and my book, The Pruning Book, attempts to make readers better artists and scientists, when pruning, at least.) As far as those old stems, they should be cut down near ground level once they’ve overstayed their welcome. So what was I left with when I was done pruning? Nothing. Nada. Zip. Well, not really; the roots were still alive and in the ground. And I’m banking on those roots sending up new sprouts. And because ‘Sunny Boulevard’ is slated to start blossoming in July on buds that form on new shoots, I’m also banking on blossoms on those new shoots. Because they’re beginning growth way down at ground level, blossoming might begin a bit later than usual. Shrubs that blossom early in the season, such as forsythia, lilac, and mockorange, form their flower buds a year before they actually open. Hence, the best time to prune these shrubs, if you want a full show of blossoms, is right after the blossoms fade. Prune them before blossoming and you cut off potential blooms. Still, having a clean slate after a dramatic renovative pruning is appealing, sometimes even with a sacrifice of blooms. Deb is now nervous about the lilac bush, which also needs some renovation. I’m planning to do a less dramatic renovative pruning on it, and I’ll probably wait until after it blossoms. Big onions or medium-sized onions or small onions, what to grow? The choice is mine (and yours). Much depends on planting distances. I’m opting for medium-sized onions, about 3 inches in diameter. Yesterday I set out about 250 transplants grown from seed I sowed in early February in a tub of potting soil: Three varieties: Ailsa Craig, an heirloom from 1887, for sweet, mild onions that need to be used early because they don’t store well; New York Early, a nonhybrid variety selected over the years by New York onion growers, for medium term storage; and Copra, a rock-hard, hybrid onion that stores very well, all the while maintaining some sweetness. 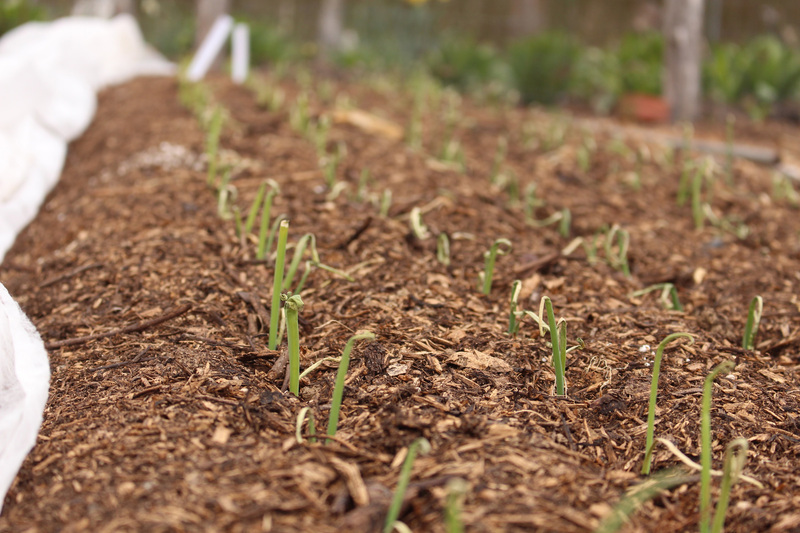 In a 3-foot-wide bed, I planted 5 rows of onions, with about 4 inches between rows and about 4 inches between onions in each row. Even among northern varieties of onions, potential sizes vary. Ailsa Craig onions have the potential grow quite large, which is why they’re grown for exhibition at state fairs and the like. I’m banking on the close spacing keeping them from growing too big, 5 pounds or more by some accounts. Of course, good growing conditions also make for more leaves sooner. Got that. I spread compost an inch deep over the already mellow soil and drip irrigation lines are poised to quench the plants’ thirst. 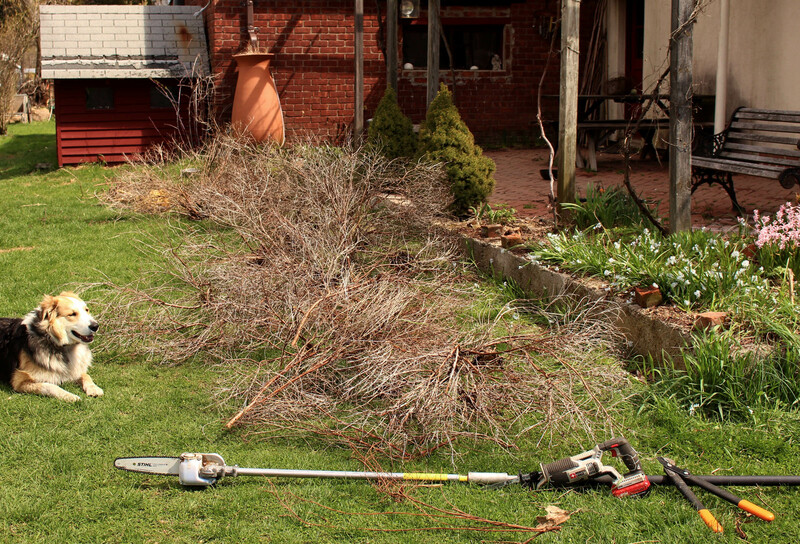 This entry was posted in Gardening and tagged Fiskars, Porter Cable, pruning, renovation, st. johnswort, Stihl. Bookmark the permalink. Trackbacks are closed, but you can post a comment. Funny you should mention renovating lilacs. I renovated my lilac over a period of about five years, cutting the last of the enormous tall stems to the ground last year. To my dismay, I haven’t gotten much rebound growth; just two flowering stems so far. Fertilize? Take out? And how does one remove an enormous lilac root anyway? Did I miss your plant sale? Or if not, when’s it scheduled? Regards and hope for rain. Plant sale is May 30th, 10 am to 2 pm. Would this pruning technique also be suitable for my Deutzia “Chardonnay Pearls” which have become quite voluptuous and are overtaking my front garden? Just shave them to the ground now that they have blossomed? Severe pruning should be okay with the Deutzia. It’s a slow grower, though. Thanks for the inspiration! Just cut back 2 large Clethra – Summersweet shrub to 6″, hope they come back. They took a hard hit the last two winters and were looking very unsightly after 12 years in the ground. With regards to big Lilac shrubs I have good luck with removing a couple of the oldest stems every third year or so, right after they finish blooming, and new shoots come up. I add compost on top of the soil every 2-3 years. Your lilac pruning is just right. The dramatic approach is for a neglected shrub. What do you do with all the wood you prune off every year? Do you have a chipper shredder that you can recommend? The town picks it up, grinds it, and then uses it to make compost. I just today stumbled on to your blog through a post on Pinterest and I have been reading all of them, one by one, starting with early May this year. Can I say that not only am I delighted to have found you for all the wonderful information but the best thing is your sense of humor. I’m posting on this one because your “Henry IV Method of Pruning” title made me laugh out loud – and then laugh again after I read about your St. Johns pruning.